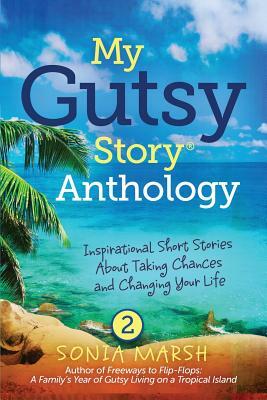 Sonia Marsh, author of Freeways to Flip-Flops: A Family's Year of Gutsy Living on a Tropical Island, compiled this collection of stories from 46 authors to, as she says, "bring out the gutsy in you." All of these authors found the courage to face their fears and live their dreams. The stories are unique because of the authors' willingness to openly share the obstacles they surmounted and the strength they developed to overcome doubt, fear, rejection and grief. Sonia hopes this celebration of gutsy living - about taking chances and changing your life - will inspire you to follow their lead and experience your own gutsy adventure. If one story speaks to you directly and results in a change in your own life, please e-mail Sonia Marsh directly at sonia@soniamarsh.com.